Dwarf apple tree supported by single wire and conduit with wooden posts no more than 50 ft. apart within the row. Photo: Jon Clements, University of Massachusetts Amherst. When propagated on dwarfing rootstocks, most apple cultivars will lean or fall over as they start to fruit. Trees on dwarfing rootstocks tend to produce heavy crops relative to the size of the tree, and the tree cannot support the weight of the crop. Many dwarf rootstocks also produce relatively shallow, brittle root systems and are prone to being uprooted in severe storms. Trees on dwarf rootstocks must be supported to keep trees upright. For the homeowner with few trees, the easiest way to support trees is to place a 6-foot to 8-foot-long wooden post next to the tree and secure the tree to the post with some type of twine. The bottom of the post is usually placed within 6 inches of the trunk with 2 feet below ground. 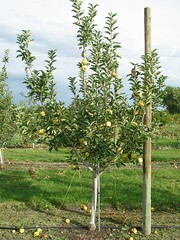 In larger fruit plantings, where trees are planted in rows, less expensive tree stakes are preferred. Eight- to 10-foot-long, half-inch to three-quarter-inch diameter conduit secured to each tree has performed very well. The conduit by itself will not support a tree, so the conduit is tied to a wire 8 feet above ground. The wire is supported by 10-foot to 12-foot-long posts spaced no more than 50 feet apart in the row. Cultivars with brittle wood, such as ‘Gala’, may break at the bud union when a single wire is used. Tree survival may be improved by placing a second wire about 4 feet above ground and tying some of the branches to the wire. Bamboo poles are less expensive than conduit but may split and break after about 8 years. A less expensive form of support that has been effective in commercial plantings involves securing the trees to 3 or 4 wires spaced vertically about 3 feet apart, starting about 3 feet above ground to form a trellis system.